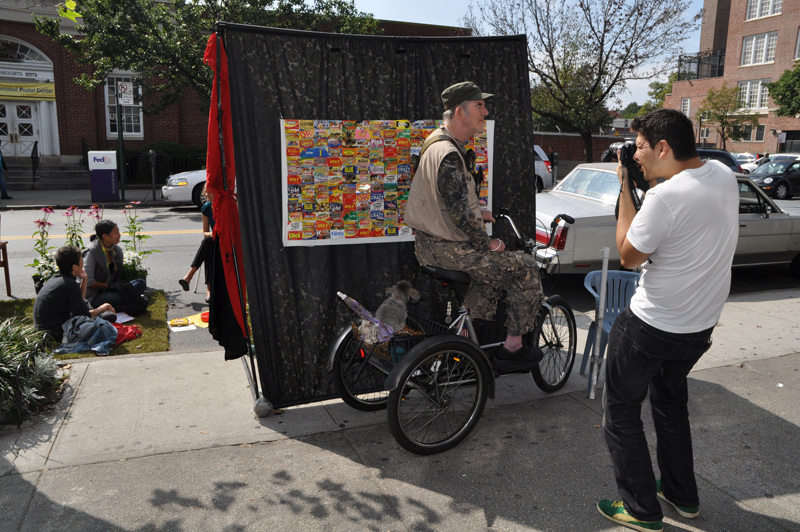 Carlos’ Photo Booth Without Borders invited Jackson Heights locals and passersby to share their personal journeys as human beings, New Yorkers, and immigrants through a portable photo booth-meets-confessional.This booth was built mostly from repurposed materials and made stops at different laundromats in one of the most diverse neighborhoods in the United States. Carlos recorded participants’ personal stories and took photographs of them interacting inside the booth, including backdrops of a world map and a calling card mosaic, among other elements. Participants then received an instant photograph and a calling card in exchange for sharing their story. This project welcomed people of all ages and backgrounds to build a sense of community through storytelling. Carlos A. Martinez is a Colombian-born environmentalist and photographer based in Jackson Heights, Queens. For the past five years, he has worked with Green Map System, a non-profit organization that promotes inclusive participation in sustainable community development worldwide, using mapmaking as its medium. As a photographer and educator, he has worked with the International Center of Photography’s Community Programs on their youth program at The Point in the South Bronx; National Geographic’s Photo Camp; and a photography program with youth transitioning out of incarceration in partnership with Friends of Island Academy. previous post: Sustainable. Organic. Stewardship.